Massachusetts Avenue Project in Buffalo. I am at home for a few days cleaning off my desk, checking off my to do list and planning my schedule for more trips around the country. It’s going to be a busy end to summer as I plan to work with many chefs on their CCC testing, begin preparing for the Culinary Olympics in 2012 and continue to oversee our day-to-day operations. There is one event in early August I am very excited about. Delaware North Companies has begun a partnership with the Massachusetts Avenue Project and its Growing Green Program in Buffalo, NY. 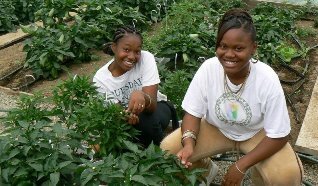 This program helps local school kids learn about healthy food and how they can help the Buffalo community through farming, healthy nutrition, and taking care of their environment. This is a very important issue and I’m proud of our company for teaming up with it. Kids need to learn the importance of eating healthy. It’s an important part of our lives. I could never explain the program and project as well as their website does, so I hope you to visit it at http://www.mass-ave.org/. Along with supporting this program, Delaware North is also going to do some “fishy” business with the organization. Massachusetts Avenue program has award-winning gardens and a greenhouse that can produce 35,000 tilapia a year. The fish are raised naturally and we will be offering some of them on our menus at Buffalo-area venues where we operate. This will enable our company to offer fresh, local fish. We will also utilize some of the produce grown in the gardens. Delaware North will host a cocktail party for potential donors for the program in early August. I will post the full details once I have them. Everyone who attends can visit the farms and taste dishes that feature the fish and greens. Even better, everyone who attends can meet me and talk food. I look forward to the event. Alright, on to the next To Do on my list. This entry was posted on Friday, July 23rd, 2010 at 11:10 am and is filed under Uncategorized. You can follow any responses to this entry through the RSS 2.0 feed. You can leave a response, or trackback from your own site.